Visitors to and locals of Nunavut enjoy some remarkable angling all year long. One popular place is Nueltin Lake. Nueltin Lake Fishing Guides are definitely the professionals who fully understand all of the secret spots on the inland estuaries and rivers, waterways, waters and fish ponds. Nueltin Lake (meaning “sleeping island lake”) straddles the Manitoba-Nunavut border in Canada. The lake, which has an area of 1,851 km2, is predominantly in Nunavut’s Kivalliq Region, and on the Manitoba side there is the Nueltin Lake Airport which serves the fishing lodge. The lake is split into two parts by a set of narrows. 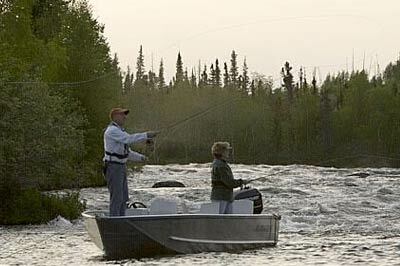 Whatever you choose, a Nueltin Lake Fishing Charter or Nueltin Lake Fishing Guide, you’re certain to have fun on your angling voyage in Nueltin Lake. I would like information on the different types of packages and pricing. Hi David. Unfortunately the last of the Nueltin fly-in Lake Lodges closed operations a few years ago. I would recommend you contact Gangler’s North Seal River Lodge on Egenolf Lake in Northern Manitoba. They have several outposts in the area and also do fly-outs to various lakes in the region.